A few days ago, actually last weekend – where did the week go? 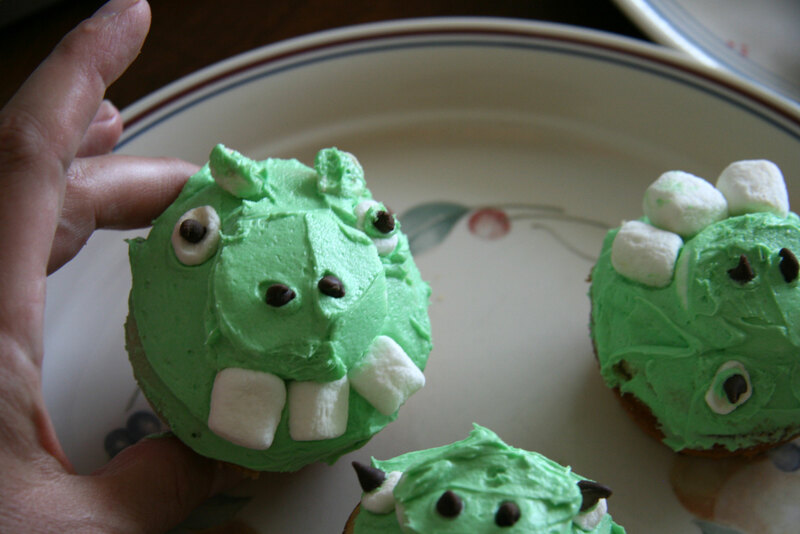 – David, Davey and I made “Angry Bird” cupcakes. Davey has been all about the Angry Birds lately. Sometimes I play on my phone and he plays on David’s phone, and we sit side by side with our Angry Birds. 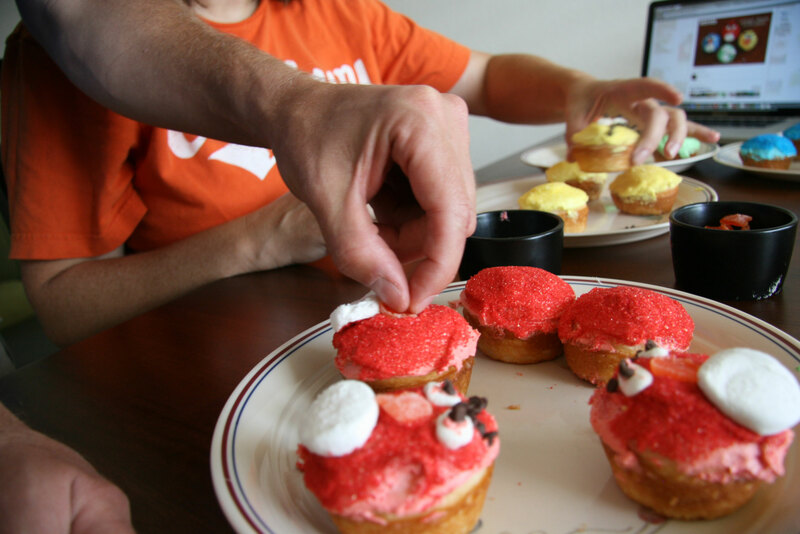 So last week we decided to make Angry Bird cupcakes. We found some guidelines on pinterest. 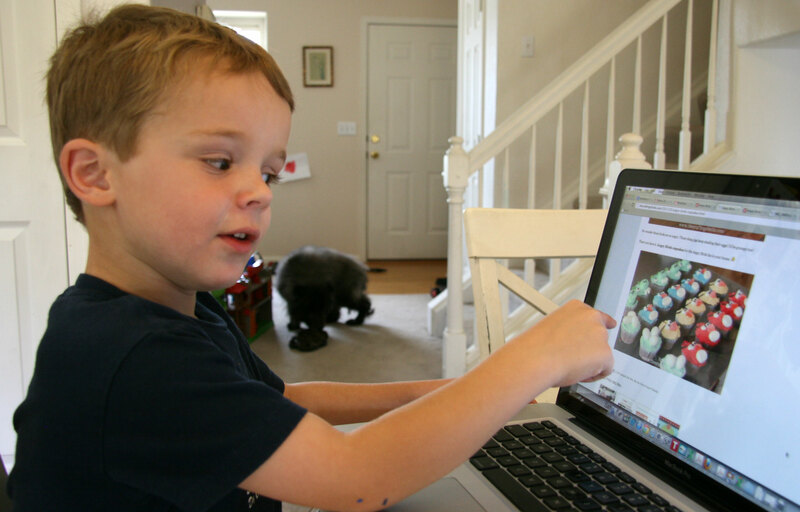 Davey carefully reviewed the website. Constructing the faces required several ingredients: food coloring, sprinkles, candy orange slices (those should not be anywhere near me. I can’t resist them), mini marshmallows, marshmallows, and mini-chocolate chips. We were supposed to make the eyebrows with skinny black licorice whips, but none of us like black licorice. 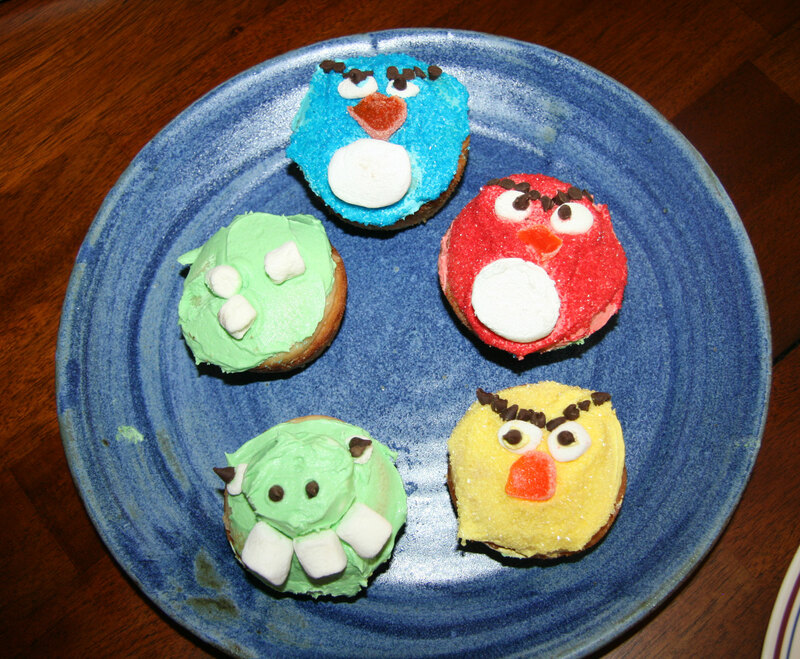 I kind of wish we’d gone with it anyway though, because achieving the “Angry Look” is pretty key to a successful Angry Bird cupcake! We made do with mini chocolate chips. So I got everything all set up. I used white cake mix for the cupcakes, but I made homemade butter cream icing. we had to dip the cupcakes into sprinkles after we added icing. That’s quite a few sprinkles. Of course, Davey had no problem with mega sprinklage. David took this task seriously. I picked out the best of the lot for a final picture. Pretty fun project! Davey loved the process. 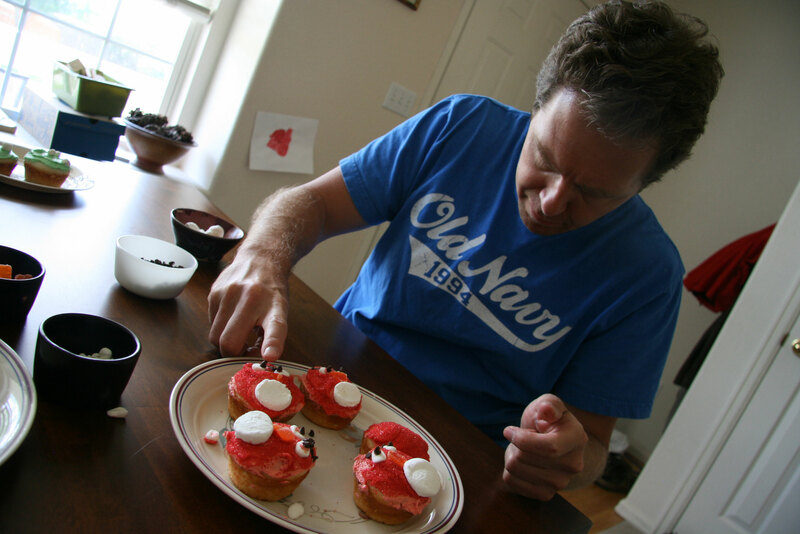 Davey loved the icing. He always loves the icing. 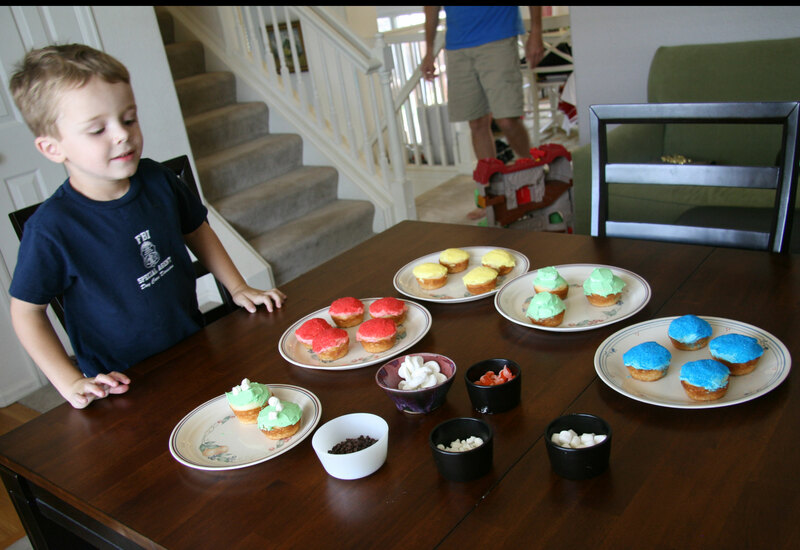 Great cupcake decorating! Tell Davey I saw lots of angry bird Halloween things at Toys R Us on Saturday.